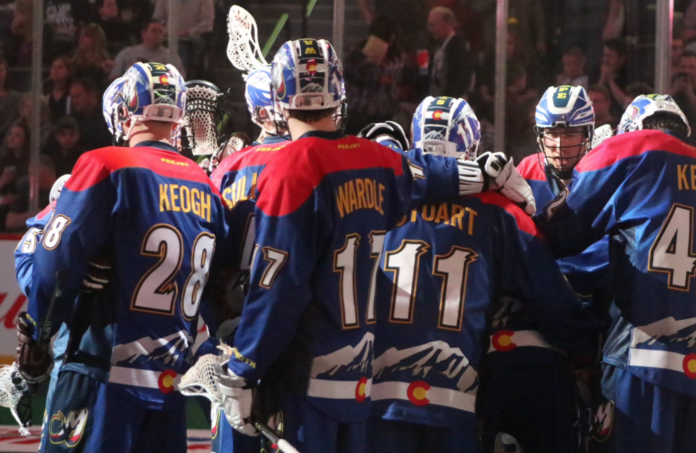 Celebrating “303 Day” by wearing blue, red and yellow jerseys and helmets, the Colorado Mammoth extended their winning streak to three, defeating the Buffalo Bandits 8-7 after surviving a fourth quarter scare. The Mammoth returned home for the first time since Feb. 2 to play the second of a back-to-back weekend series. After a fourth-quarter comeback against the Georgia Swarm, they put their two-game win streak up against the Eastern Division-leading Bandits and former Mammoth goalie Alex Buque. Backup goaltender Steve Fryer started his first game in a Mammoth uniform and played lights out, stopping 46 shots to extend the Mammoth’s win streak to three. 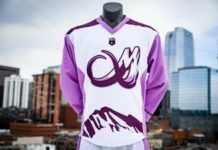 The team’s uniforms payed homage to the colors and design of the state flag for the game played on March 3 (3/03) — an unofficial day of celebration in the Mile High City paying homage to Denver’s primary telephone dialing code, 303. (The state’s official “Colorado Day” is August 1, to commemorate the state’s admission into the United States of America in 1876. Things started out shaky for the Mammoth, who forced several bad shots and let Buffalo get an early power play. The Bandits capitalized to take the lead, but defenseman Joey Cupido answered back on a three-on-none break. 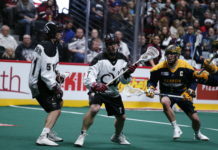 The Bandits took a 2-1 lead to end the first quarter before the Mammoth offense began to heat. Forward Jeremy Noble put one past Buque to tie the game, and the Mammoth began working their passes across the field, forcing Buque to move side-to-side more. The Bandits’ goalie struggled with the Mammoth ball movement as Colorado piled three more goals into the net from forwards Chris Wardle and Ryan Benesch to take a 5-2 lead at halftime, while the Bandits struggled to even get offensive control of the ball and went on an 18-minute scoring drought that lasted partway into the third quarter. The Mammoth continued the offensive flurry into the third quarter after allowing two quick consecutive goals. Benesch, Jacob Ruest and Zack Greer all put one past their former teammate to give the Mammoth an 8-4 lead going into the fourth quarter. Things began getting dicey though, as the Mammoth began to play more passive with their four-goal lead. The Bandits finally put one past Fryer with just over seven minutes left to play, taking advantage of the lax play by Colorado to gain some momentum. This translated into two more goals, making the score 8-7 with over three-and-a-half to play before the Mammoth tightened down the defense. 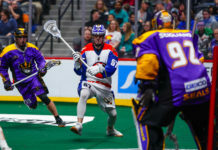 The Bandits fired off four more shots and even pulled Buque for an extra man, but the Mammoth were able to gain possession and run the clock down to one second. A desperate heave by Buffalo across the entire length of the field was not enough, allowing the Mammoth to survive the scare and hold on for an 8-7 victory. The Mammoth improved to 7-3, extending their lead over the Calgary Roughnecks in the Western Division to three games. Colorado stays at home to play Calgary on Mar. 10 before going on the road to play the first game of a home-and-home set against the Vancouver Stealth the following two weeks.